First I want to send K-9 Angels and my foster family many tail wags in thanks for rescuing me and giving me a chance to find a new home. I’ve been with my new family for a couple of weeks now, and I am so happy. My new family includes two humans, another dog, and a cat. My humans love me, and I love snuggling with them. They tell me I’m very smart and I’ve learned to sit and do some tricks. I get along with all the animals, and like having another dog to run around the yard with. They even take me camping and on long walks in the state parks. So many interesting things to see and smell! I love my new forever home! 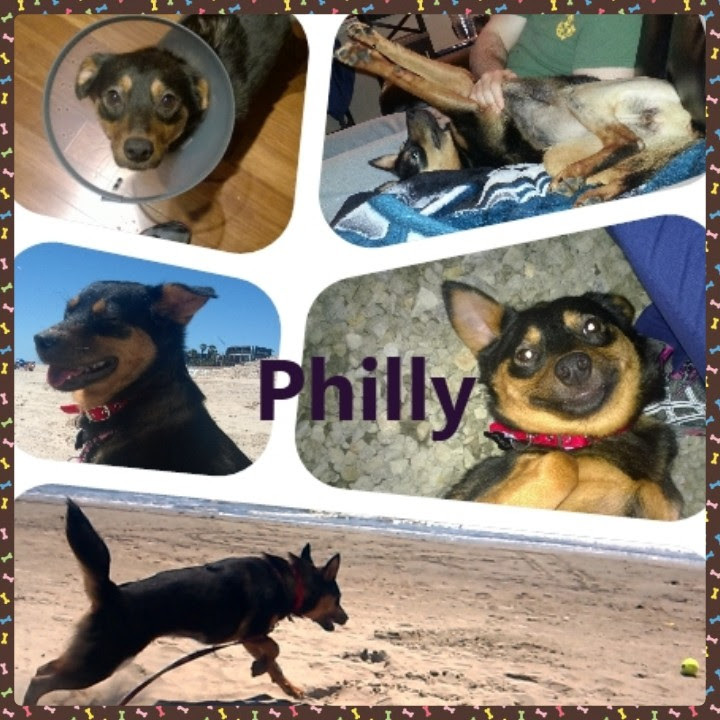 happytails@k-9angelsrescue.org. We LOVE to get updates! but still need to choose the Love of your Life? Surely you can find THE ONE right here! Well, I think it is love! We have all been having a great time with Snowflake, who I’ve been calling Snowy. I had wanted to send you an update this past Saturday, but things got busy. My five-year-old daughter, Emma, is especially crazy about her. I think it is mutual. Snowy is so sweet. Since Emma didn’t get to pick Snowflake, we let her pick out a new collar, leash and harness. She decided on a purple and pink set with a flower. We have introduced Snowflake to my parents’ nine-year-old golden retriever, Sandy. Sandy is a bit old, and slow, and weighs around ninety pounds. Things completely change when Snowy comes over. They have a great time playing together. Since my previous dog was older and slower, this was a whole new experience. We have not seen Sandy this active in years. When she gets tired, she gets up and bumps into Snowy with her hips, and they both go take a nap for a while. With the exception of last Friday, we’ve taken Snowy over with us every day. I think that Snowflake is really getting into our routine. She seems to enjoy the little walks that we take around the neighborhood in the evening, and even when we walk her together with Sandy. She is still a little apprehensive in the car, although she is getting in a tad bit easier each time. Our drive is less than two miles, so she isn’t in there long, and Emma is usually in the back with her. Snowy has been sleeping in my bed at night. She always starts down near my feet, but by morning, she is tucked under my left arm. She wakes me up in the morning by nuzzling into my neck and stretching her legs. Although we have had a couple of accidents at my parents’ house, we have yet to have any potty issues at mine. When she does want to go outside, she sits by the mat by our backdoor and gives the tinniest little cry. We’ve been surprised that she doesn’t bark too much. She usually only does it when we are playing, or to try to get Sandy to play with her after a good rest. We still have to watch her fairly closely outside, as she likes to dig in the flower beds. She has also chewed up one of my kindle chargers. Fortunately, it wasn’t plugged in at the time. 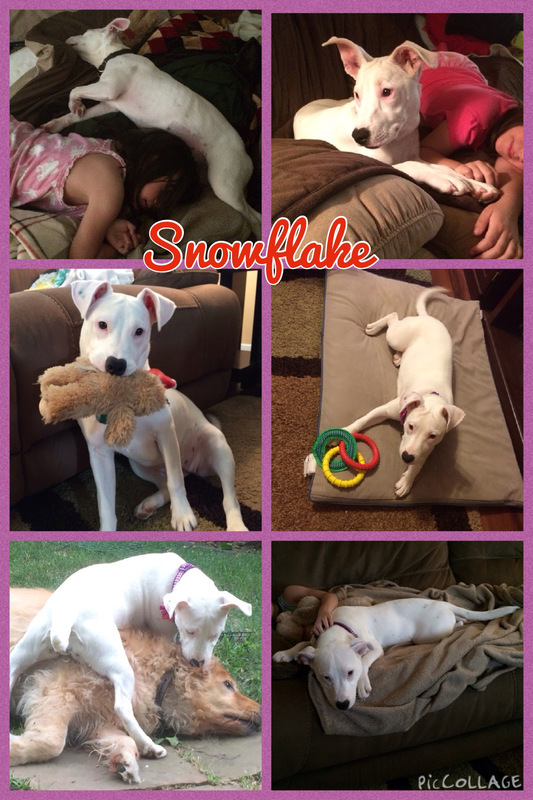 Everyone has really fallen in love with Snowflake. My 94-year-old grandmother lives with my parents. She doesn’t hear very well, and has macular degeneration and fairly severe dementia, but she consistently remembers Snowflake’s name. Although we don’t know how, she says that she has been able to see Snowy’s black spots. My parents and I both think that she gets more spots every day, and that they are getting darker. Also, we seem to think that she is more of a bull terrier-mix than a lab-mix. Our vet agreed. Snowy has been having a good time with the toys that Emma picked out for her, but I think her favorite is still the teddy bear in the Santa hat that you had passed along to us. Once again, thank you so much for taking such good care of Snowflake. She really is a joy for all of us. I’ll still keep sending photos along every so often. Please feel free to ask for an update at any time. 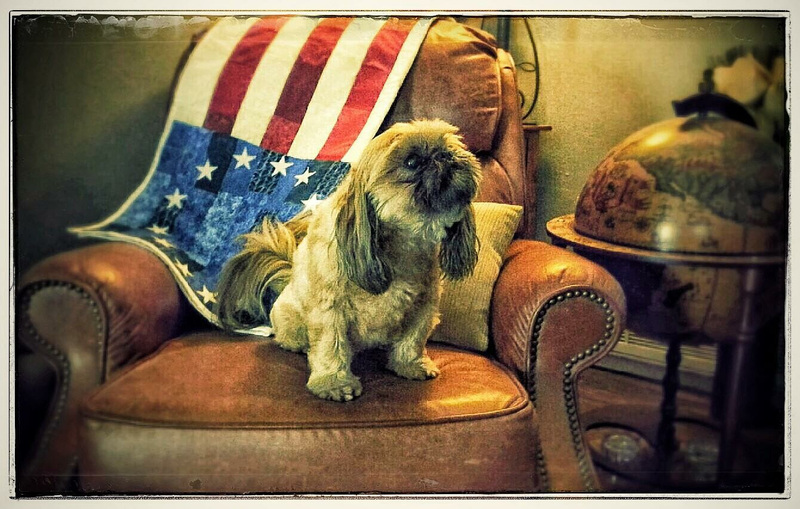 I wanted to update you on Animal, a blonde Shih Tzu I adopted from your group in Nov 2013. When I brought him home he was 8 lbs. and had dreadlocks and wasn’t exactly house broken. Today he is 14 lbs., has Hasselhoff hair and tells me when he needs to go outside; of course it’s up to me to listen. Just wanted to let you know you made a difference in our lives by rescuing him and helping me find my guy! He is in a dog park mayor contest, so this is his official campaign ad. Got to keep his press consistent! Texas already has some of the toughest dangerous dog laws in the country. A dog does not even have to bite, scratch or touch a person to be declared dangerous under current Texas law. Read about the problems with HB 1800.
on Tuesday, April 21, 2015. Please let these Representatives know to VOTE NO on HB 1800! Woof! Philly was a very shy girl when she first got to her new home. She needed surgery after an injury to her left hip, which K-9 Angels generously paid for, and we’re happy to say she’s recovering quickly and becoming one happy, playful pup! Every day her leg gets stronger, and she’s learning how to run and play. She has opened up so much since the adoption. She loves to snuggle on the couch and give lots of kisses. Adopting this little girl is one of the best decisions we’ve made, and we’re so happy to have her in our family. 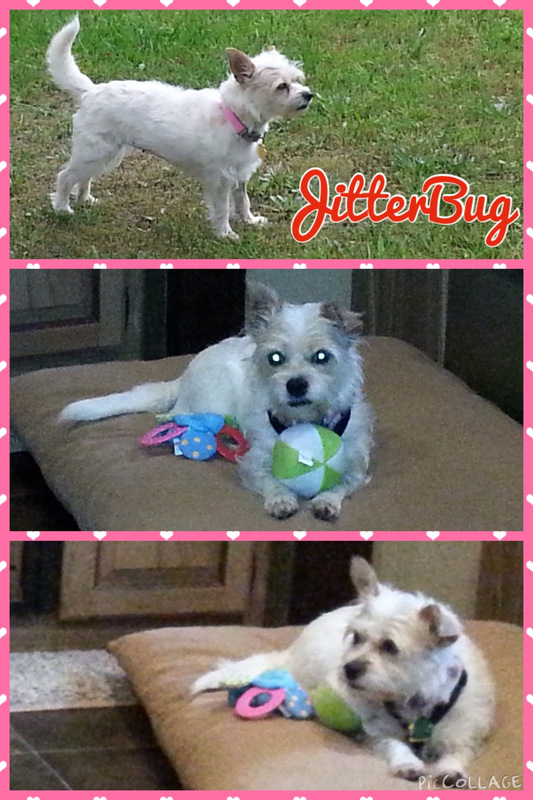 Mom and I adopted “Jewelz” in Nov 2014. I had to do some sweet talking to get her! Mom is 80 and of course there were concerns about her ability to manage a bundle of energy. I reassured K-9 Angels that I (her human sister) would be around to care for her and take her on long walks. 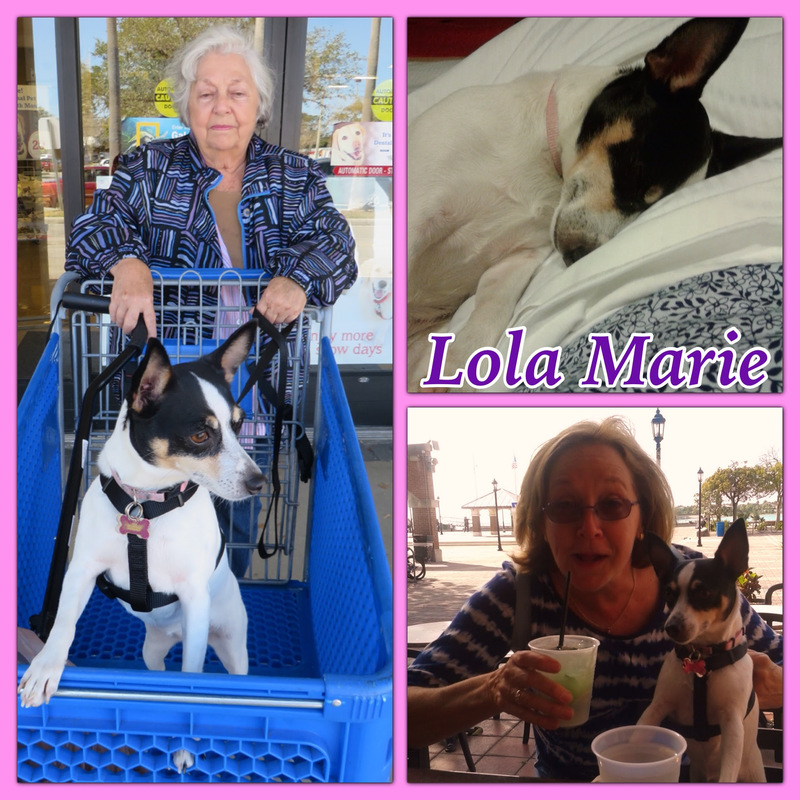 Her new name is Lola Marie. She is the best dog in the world as my dad is fond of saying. She recently took a 3000 mile round trip journey to Key West Florida with her adopted Mom and sister. There was one episode of carsickness and that was it. She loved the experience, especially walks on the beach and staying in pet friendly hotels where she could jump from bed to bed sharing her love! Not sure if you are ready and capable of owning a dog? In the not so distant past, people worked for the things that they bought. They saved, purchased what they needed and then held onto that item for a considerable length of time. Today, our society has evolved into an instant gratification, everything is disposable, group of individuals. To what cost? So many people seem to feel that they deserve to have something if they want it. And if they get something, many do not see the value in that “something”…. if it breaks, throw it away. If it goes out of fashion, throw it away. If it becomes a hassle or boring… throw it away. Sadly, it seems as if pets have fallen victim to this disposable way of thinking. Individuals want a pet (dog or cat), so rather than thinking of the full implications of owning that pet (time, money, owning for the duration of that pet’s life), they just get that pet that they think that they deserve. For some people, dogs have become fashion symbols… there are many that consider the purse or “pocket” dogs to be chic and hip; unfortunately when the fad passes, too many dogs are dumped. There are also those individuals who have decided that a pair of unaltered pets equates to quick cash – hit Craigslist every few months with “puppies for sale” and someone pockets easy cash…. quick, easy money with no thought to the true cost. No consideration for the thousands of dogs dying in shelters – “I deserve this money, it’s easy, I’m going to do it” seems to prevail instead of compassion and common sense. Many individuals have dogs that get hurt or sick – it’s easier and cheaper to dump them at the shelter than to pay a veterinarian to “fix” them. Disposable society – broken? Throw it away….. This instant gratification, disposable society is taking a toll. Everyday I see the urgent postings. I see the pleas to save lives. Everyday I see a rescue begging for foster homes because there are dogs that NEED to come into the safety of a foster home. Every week I get an email from a volunteer – the email has a long list of dogs and it is “urgent” that they be pulled because they are on the dreaded “E-list”. The volunteer goes on to state that the “shelter is slammed with 50+ incoming dogs a day”. Think about that number… FIFTY DOGS A DAY?! At ONE shelter. Years ago, there were shelters that picked up strays and took in the occasional dog from an ill or deceased owner. Today they are taking in the cast-offs from breeders that have dogs past the age of producing. They take in the puppies that didn’t sell on Craigslist. They take in the hundreds of dogs that people don’t want to take the time to work with. Dogs are surrendered for the simplest (silliest) of reasons. “Got too big”, “Sheds too much”, “I don’t have enough time”, “Moving”… the list goes on and on. Can you imagine what would happen if parents could dump their children when they were too difficult?? Can you imagine if there were state agencies to take in the cast-offs in the same way that animals are allowed to be turned over? If people were allowed to be un-committed to this extreme to their human children? Society would be in chaos. Somehow, someway, society needs to realize that owning a dog is a privilege, not a right. Just because you want a dog, does not mean that you are fit to own a dog. Just because Fifi looks cute in your hot pink purse does not mean that you MUST have Fifi. Not sure if you are ready and capable of owning a dog? Foster for a rescue first. You’ll help a dog in need AND you will see what dog ownership entails. You’ll see firsthand what it’s like to have dog hair in the house. What it takes to keep a dog happy and healthy. It may be short-term, but fostering offers valuable insight. And society needs to realize that if they made that commitment to own a dog, an actual commitment must be made. If that dog gets hurt or sick, take care of that injury or sickness. If it’s a struggle to handle the needs of your dog as the years go by, deal with it. Figure it out. Just as parenting can be a struggle, so can dog ownership. You make accommodations in your life to make the things of value work. Everyone needs to work together to help educate our society’s youth. Teach the children that dogs are living creatures with feelings. Teach the children that dogs are to be valued and respected. Educate children about the importance of altering family pets. The changes have to start somewhere…. Follow the National Dog News Examiner on Facebook.